Crib-biting and windsucking are equine vices in horses and ponies that can occur due to inactivitiy, boredom, stress or excitement. can be copied from other horses. This can develop into a permanent habit or stable vice. Crib-biting and windsucking are different variations of the same vice in each case the horse swallows air. When cribbing the horse or pony grabs hold of something like a stable door or gate, arches his neck, then gulps air. Windsucking involves the horse swallowing air, usually without grabbing anything with his teeth. A horse that crib bites grasps a stable fitting, such as the door or his manger, or another convenient object with his teeth, and then depresses its tongue and swallows air. This can lead to excessive wear of the horse's incisors or front teeth. The muscles along the underside of the horse's neck also become over developed as they as are contracted as the horse assumes the position of crib-biting. It is difficult to stop a horse cribbing once this equine habit has become established - but the use of a crib-biting strap or collar is effective when used in early cases. As the horse arches his neck the metal plate of the strap presses on his throat making swallowing difficult and unpleasant. When the horse is swallowing food and water normally the plate in the collar hangs loosely causing no discomfort or interference. Windsuckers achieve the same end as crib-biting in that air is swallowed, but it does not require a resting place for the teeth. 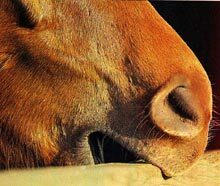 The horse or pony swallows air by closing the mouth, firmly arching the neck and forcing the air down the oesophagus. This action is accompanied by a gulping noise. Some horses which have been crib-biters learn to windsuck when remedial measures are taken, and some windsuckers learn to crib bite. In severe cases of windsucking and crib-biting horses will lose condition. To attempt to stop these stable vices increase the level of exercise that the horse receives. Also try try to prevent boredom, stress and other stimulating factors by reducing the amount of time that the horse spends alone in his stable. When the horse is stabled to to provide more things to interest him and prevent boredom. Provide toys such as feed balls, hanging salt licks or even a swede suspended from a rope. A non equine stable companion such as a goat can often keep a horse from becoming lonely and bored. Using electric fencing along the top rail of fencing in the field can prevent crib-biting on paddock fences while the horse is turned out. There is a surgical veterinary procedure designed to treat this equine condition called a modifed Forrsell's operation. This involves sectioning of a branch of the accessory nerve and the muscles involved in the arching of the horse's neck. a 60-80% success rate preventing windsucking & crib-biting in horses and ponies has been reported in various surveys when the treatment is used with other management techniques.